After many years, a great deal of research, and improved quality amongst companies, we at Parkside Health & Wellness Center, have invested in a Class IV laser to help our patients. Even with the many techniques, and various methods we have to help people with many musculo-skeletal complaints, we found there were still a few issues we had a hard time treating with consistent results. This definitely applied to some of our professional, and amateur athletes, who had a hard time (refused) to give their bodies a chance to rest and heal. Most college and professional sports teams now use lasers as a part of their training regimes to stay healthy, and recover faster. Of course it also works great on stay at home moms, weekend warriors, and desk jockeys. These complaints range from tendinitis in virtually any area, plantar fascitis, tennis elbow, golfers elbow, ligament injuries, meniscus injuries of the knees, frozen shoulder, bursitis of the hip and shoulders, disc injuries, nerve entrapments, and the list goes on to encompass most soft tissue injuries. Class IV lasers also have the ability to speed up would healing, as well as toenail fungus. How can a laser be so effective for all these issues? Well here is the basics of how it works. Laser is energy in the near infared range, so it is virtually invisible to the naked eye, but has the ability to penetrate several inches into living tissue of both humans and animals. It stimulates healing by a process known as PhotoBioStimulation. This is best compared to photosynthesis in a plant. Photons are directed into the tissue via the laser and stimulate unhealthy / damaged cells only. 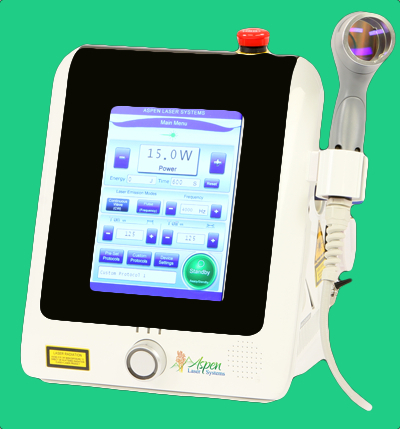 The laser has virtually no effect on normal healthy cells. Pain relief is one of the first things people notice, but what happens to the tissue most important. Photons stimulate the cells, especially the Mitochondria of cells, which is the energy powerhouse of a cell. This increases cellular metabolism, thus stimulating faster cellular repair and healing. The photons help to reduce inflammation and the process caused by damaged tissue, yet it stimulates vasodilation, and nitric oxide. This means circulation increases (angiogenisis), allowing waste products and damaged cellular components to be removed, and new rebuilding material can be brought in. This accelerates the healing of tissue. Lasers also help to reduce fibrous tissue formation. This means there is a decrease in scar tissue and adhesions, which are often found in joints after an injury, surgery, or damage. One example is frozen shoulder. Nerve function is also improved with laser therapy, as it destimulates pain receptors and nerves, but also helps regenerate nerves to heal and re myelinate. After an injury, there is also a process of immune stimulation (usually to prevent a possible infection, but it can cause additional inflammation), and lasers can help with immunoregulation which helps speed up the healing process with less inflammation and pain. Class IV Lasers can also be used to stimulate acupuncture points which helps the healing process.